Most visitors of Salzburg know it as a beautiful city in central Austria; many tourists miss that Salzburg is also the capital to a federal province called either with the same name or referred to as the "Salzburgerland". This province (Austria has a total of nine federal provinces) is divided into six administrative districts or counties: Salzburg (the city itself), Salzburg Umgebung (the surroundings of the city), Hallein, St. Johann, Zell am See and Tamsweg. The latter four have their name from their respective capitals. 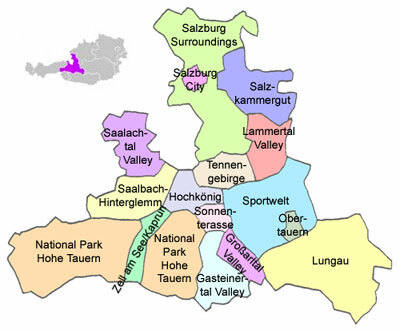 The administrative division of the Salzburgerland matches with the traditional regions Flachgau and Tennengau in the north, Pinzgau in the West, Pongau in central Salzburgerland and Lungau in the province′s South-East. For international visitors, a division of the Salzburgerland into political districts is not very interesting. A lot more relevant, on the other hand, is the division into "tourist areas", the so-called "destinations". The Salzburgerland is sliced into a several destinations that target different kinds of visitors. This matches with the geography of the Salzburgerland: The north is hilly at most, with many lakes and densely populated; at the Tennengau, you get into the Northern calciferous Alps; and the central and southern parts of the Salzburgerland are thoroughly alpine, with Mount Großglockner overshadowing all other mountains right at the southern boarder of the Salzburgerland. The division of the travel destinations: The city of Salzburg is obviously one, even the most important one. Here you find all the cultural delights you could possibly hope for - at least as far as Classical music and "The Sound of Music" go. The surroundings of Salzburg along the Salzach valley and towards the northern Flachgau are called "Salzburg Umgebung", just like the political district; this area is the least touristy in the Salzburgerland, at the same time, the area where most people live. The hotels that you find here usually board for the Salzburg city tourism or live off Festival guests who prefer the countryside. In the north of the Flachgau, you will find several lakes, often referred to as the "Salzburger Seenland" (Salzburg Lake District). The Salzburg share of the Salzkammergut is a different story: With towns like St. Gilgen or Fuschl, the Salzburgerland has some of the area′s hot-spots for scenic lakes, innumerable hiking opportunities and picturesque towns. Visitors are a mix of independent sightseeing travellers and nature/sports aficionados. During the winter season, gentle "family skiing" can be done in the Salzkammergut, as well as some other winter sports. Many visitors from Germany enjoy the winterly Salzkammergut it for spa and wellness holidays. In the central parts of the Salzburgerland, you find the Lammertal with very similar attractions: Mountains, some lakes and rivers, scenery; the towns are less charming than in the Salzkammergut, but also less crowded. Skiing opportunities are better, they improve the further south you get in the Salzburgerland. The area of the Tennengebirge includes some of the steepest cliffs in the Northern Calciferous Alps; great for hiking in the summer and skiing in the winter, blessed with some decent day-trip destinations within reach. Something for people that want a nature experience.